Sunday River is a big resort that somehow still feels cozy and manageable, despite having eight peaks, three major base areas and two big resort hotels. It has big-mountain action and amenities without ever feeling too crowded or commercialized. And it's no playground for posers: The trails here are among the most challenging in the East, and the remote location in Bethel, Maine, favors serious skiers and riders over the daytripping party crowds. There are more than 1,000 skiable acres at Sunday River (870 acres of trails and 248 acres of cut glades, but you're allowed to ski anywhere within the boundaries not marked "closed"), and you can see much of this expanse from the main White Cap Base Area, where the ski-in/out Grand Summit Hotel is located. Some of the off-piste skiing is surprisingly accessible, such as the unmarked, nicely thinned glades off the Green Cheese trail, full of cut logs for jumps and grinds. Sunday River is big, but you never feel like you're going to get lost here, and getting from one place to another is easy thanks in large part to Sunday River's tremendous lift capacity, which includes four high-speed quads and the unique Chondola: a hybrid that has both enclosed gondola cars and spacious, six-seat chairs. You can't ski all 135 trails and glades here in a day, and if you're not an expert, you really don't want to try. Beginners and intermediate skiers will have plenty of fun on the 89 green and blue trails, but should use caution in exploring Sunday River's expert runs. These are real black diamonds, and some of the double-diamond trails here (like the steep glades of Flying Monkey in the Oz area) are truly intimidating. However, even on peaks like the mostly expert White Cap, you're offered a safer way down, and the expanse of Sunday River offers some nice long runs that are easy on the legs. For a fun run, we liked Lollapalooza better than the Three Mile Trail, which was too flat in sections and traversed a lot of other major trails. There are plenty of easy to moderately challenging runs to choose from off North Peak, served by the Chondola. 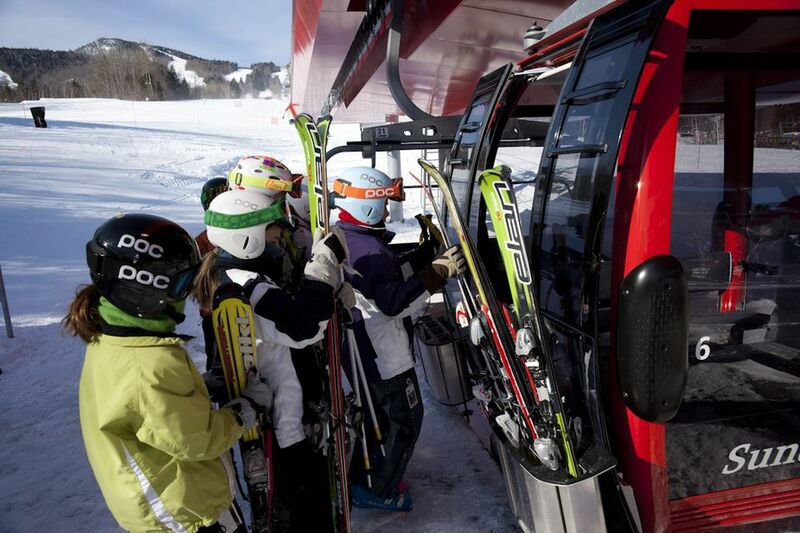 If you want to keep the kids warm and on the slopes longer, wait the extra few minutes at the base for one of the enclosed gondola cars to avoid the chilly ride up. The area also has six terrain parks, with an assortment of splines, boxes, rails and everything in between. The 15-acre T72 Park is the largest: It's home to the longest half pipe in the East. The Goat Path is among the best runs of the day: not too steep, but narrow enough to get your heart rate up as you fly along. The crossover Tourist Trap really built up on moguls and ice by the later part of the day, so try to hit this trail early if you can. The one relatively isolated part of Sunday River is the Jordan Bowl, which is accessed via a slow, stomach-churningly high crossover lift. The journey is rewarded by demanding runs like Excalibur, and you can ski back out to the rest of the area on Kansas, a green “brick road” that leads to the challenging land of Oz. The Foggy Goggle Bar at the White Cap Lodge is the best place for an apres-ski brew at Sunday River, but the Matterhorn Ski Bar on the access road is a superior hangout for live music and drinks into the wee hours. You can take a resort shuttle to the various hotels, restaurants and bars on the Sunday River property, but to get to the Matterhorn, you need to catch the Mountain Explorer bus, which runs until after midnight on weekends. You can enjoy a great meal at the Grand Summit Hotel's restaurant, Camp, too: dishes like the Grilled Atlantic Salmon with jalapeno pineapple salsa or the Camp Recipe Meatloaf with whiskey mushroom sauce exceed expectations. Cap off your day with a soak in the incredible heated outdoor pool and hot tub or with a massage at the Jordan Spa and Summit Health Club, part of Sunday River's other posh, slopeside hotel.